I’ve been thinking about 2014, how about you? I know it’s not even Christmas yet but you know it will come fast now. I’m hoping that I’m able to accomplish some things in 2014 that I really want. I’m getting my passion back which took a nose dive earlier this year simply because of exhaustion. It’s not that I haven’t been writing it’s just that I haven’t written as much as I’d hoped. Writers have to make time to write and that can be challenging. Since I finished up the last novel of my first series in January 2013 I just needed a break. I thought I was going to catch up a bit in November with NaNoWriMo and I ended up getting a horrible virus that put an end to that goal of 50,000 words. So now I’m looking ahead. I’m going way outside my comfort zone and plan to be BOLD. I will write 3 short stories to self-publish simply for the experience. I think you’ll like them. I’ll have a new novel in my new series ready by August 1st and see if I can sell that with the help of my agent. And I’m writing a non-fiction e-book as well. That’s a lot for me to tackle with the counseling job during the day but I’ve already been figuring out daily word count and what I want to have completed by specific dates. I’ve built-in margin for family needs, illness, and the unexpected. But there’s always something that sneaks up on me and wham! While I’m planning to be bold I’m also sticking to these five important Ps this year that I know will help when the going gets tough. When you plan out your writing goals at the beginning of a year what are some of the things you take into consideration? How do you pace yourself to meet your goals and still maintain your health and sanity when the adversity doggies show up? This entry was posted in Jill's Quill and tagged adversity, Goals by Jillian Kent. Bookmark the permalink. Well stated, Jillian! You go! Thanks, Jim! I’m going to explore my abilities this year. As a mother of three, the youngest being 4 months I have learned that flexibility is optimum. I have also learned that in order to take care of everyone and still get my writing done, I have to put my health first. If I’m unwell everyone suffers and nothing gets done. Unfortunately, planning anything more detailed than having a general idea of what needs accomplished that day tends to go awry quickly. I’ve learned to let the little things go, choosing my battles so-to-speak. You are wise, Davonne, to let little things go. When you have young children life is chaotic. If you can write anything at all in these circumstances that’s awesome! And staying well is crucial. I’d love to know when you get most of your writing done or if you write in spurts as time allows. I lie the idea of the 5 P’s. It’s easy to remember. 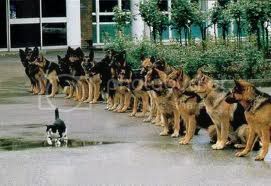 The picture of the adversity doggies is hoot!! Glad you like it, Vicki! I look at that long line of doggies and wonder what I would name each one as far as adversity goes, let’s see, I think I’ll start with a doggie named distraction and the next named ticking clock and . . . you get the idea. Thank you so much for pointing me here from my comment on Chad’s blog. It DOES take planning and preparation to be bold– especially if we want to be bold in the right way! And the reminder that prayer should always come first. So glad you stopped by to check out this particular post. I wrote this post for myself as much as anyone else looking to be brave and bold this year. May you have much success this year (whatever that might mean to you personally) and may the Christian music industry sit up and listen. Blessings as you write your songs. I think writing in spurts can be very beneficial and helps train us to take advantage of those free moments when we get to pour out our creativity into the tapestry of story we want to tell.